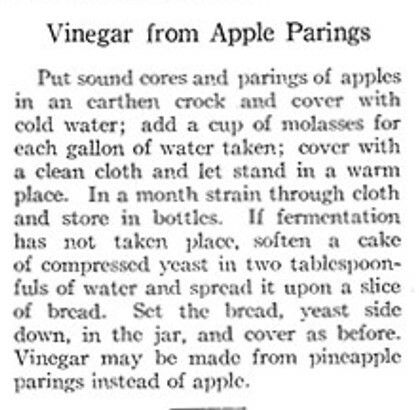 When I came across a hundred-year-old recipe for making vinegar from apple peels and cores, I had to give it a try. I put the apple cores and peels, molasses, and water in a bowl, covered with cheesecloth, set on the kitchen counter, and viola – a month later I had vinegar. 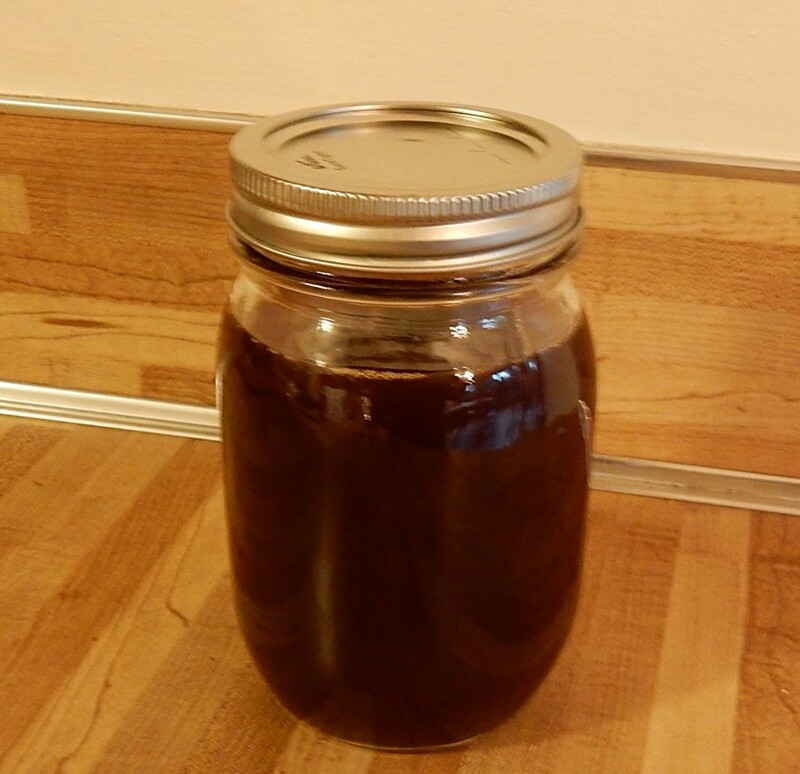 The use of molasses in this recipe results in a delightful dark robust vinegar. This recipe makes about 3 cups vinegar. It can be doubled, tripled, etc. Put the apple peels and cores in a large bowl or crock (or the peels can be put in quart canning jars). In a separate bowl stir together the water and molasses. Pour over the apple peels until covered. (The peels may float. If they do weight them down with a plate.) 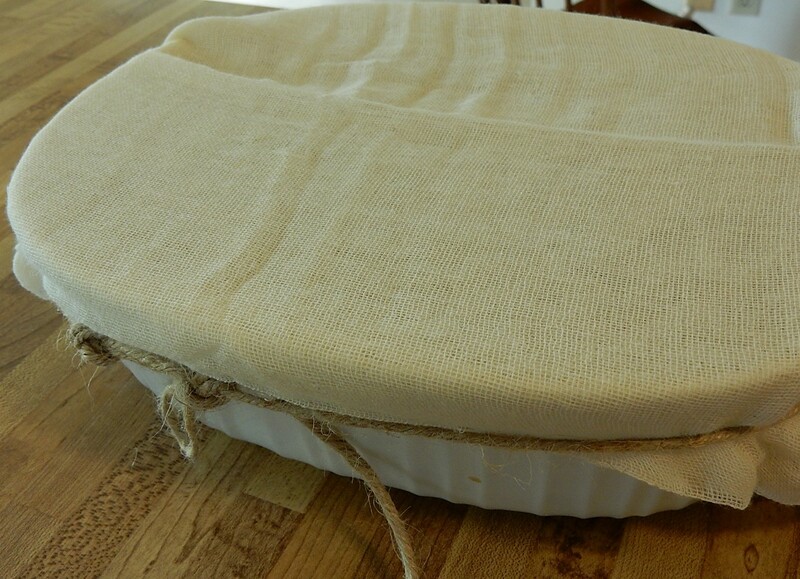 Cover with cheese cloth, and tie with a string to hold in place. After a month, strain at least three times. First strain to remove the large pieces of peels, then restrain to remove smaller pieces of pulp. Next line the strainer with cheese cloth and strain a third time. Put vinegar in bottles or jars. This vinegar will get stronger over time. Once it reaches the desired strength, store in the refrigerator to slow any additional fermentation. I did this once when I was canning apples, but ended up with mold. When I made the vinegar, I had white “mother” form which is good, but no dark colored mold formed which would not be good. When I made my vinegar, I googled several other sites that also described how they made vinegar from peels and cores; and, based upon what they said, it sounded like it was important that none of the peels or cores be above the liquid for long periods of time because that is where blackish mold would begin to form. To help keep everything in the water, I weighted the peels and cores down with a plate. I also stirred it once a week to kept ensure that nothing was permanently above water. Interesting. There are so many things our ancestors did that we would never think of doing. Very intriguing! Will give it a try. I had fun making the vinegar. You tend to think about cooking in a much more systematic way than what I do, and I think that you enjoy making vinegar. Very interesting! I’d never even heard that you could make your own vinegar. I don’t care for vinegar, so I won’t be making any. But I really enjoy reading about how you can do, and knowing that you can. Thanks for a great blog! Thanks for the kind words. Like you, I find it fascinating that I can make things like vinegar from scratch. I have a feeling if we sat down and really thought about it – there’s a multitude of household items that we used to have to make, couldn’t run out to the local market and pick up more. Much more than soap & vinegar! Yes, I think that you’re right. People were so much less dependent upon commercial products back then. This is certainly the time to publish an apple vinegar recipe! We’ve been to the local orchard twice already. It might be a push to get two quarts of cores and peels, though. When I make an apple crisp or apple pie, I’m always surprised how quickly substantial amounts of peels and cores accumulate. I might just give this a try as grilled chicken is very tasty made with vinegar like this. Great find! What a great way to use apple peel and cores. 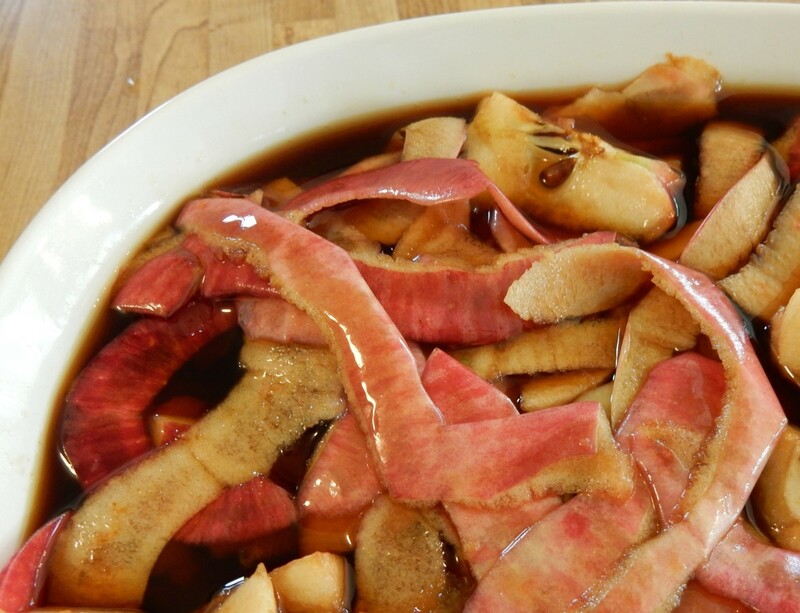 The vinegar looks very good. It’s a very nice robust, dark vinegar. I never would have guessed that you had doubts. 🙂 Cooking with hundred-year-old recipes is a fun adventure. I eat all my apple peelings and it would take a long time to collect enough cores, 1 a day from my oatmeal apple. I remember my mother made vinegar from tomatoes one year. Or was she trying to make wine? Anyway, the bottles exploded in the basement that winter.